Is split between good and evil. Coming from the Negaverse, she has her villainous qualities, but unlike Darkwing’s sister from the Normalverse, she didn’t die. On one of NegaDuck’s many jumps between the Normalverse and Negaverse, Melony found the cake portal and jumped through to the Normalverse. It turned out to be the last time anyone would be able to jump through, for it was the time when Darkwing also found the portal. While he was in the Negaverse, she was enjoying the scenery of the untainted version of St. Canard. Later when she learned that the portal had disappeared, she sought out NegaDuck but couldn’t find him. 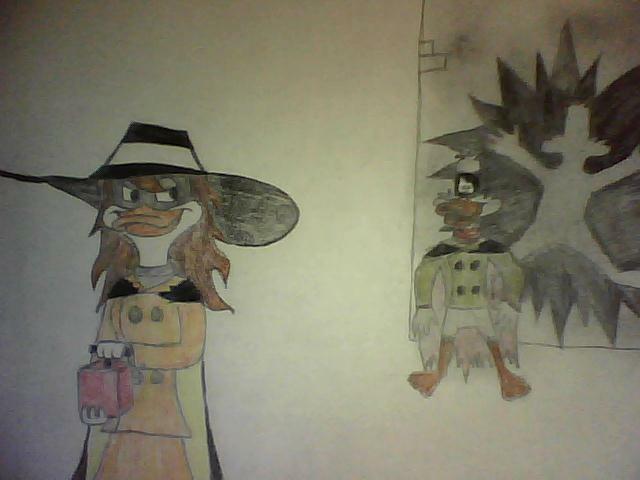 She saw Darkwing a few times, but stayed in the shadows because, to her, he was acting rather odd. She has yet to reveal herself to the masked mallard. When NegaDuck showed up again she thought that it was the same mallard so she stayed in hiding…until confronting them later on. Now she helps them both on occasion and has both criminal tendencies as well as her shining moments of justice. She loves her brother (s) and would do anything for him (them).